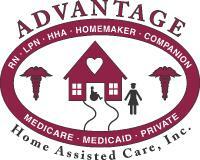 Does Advantage Home Assisted Care, Inc offer the following services? Medicare/Medicaid Certified full service Agency. Assistance you can count on to maintain your independance. We offer Homemakers and Companions, Home Health Aides, and Skilled Nursing Services. We also offer Physical Therapy, Speech Therapy and Occupational Therapy. Advantage Home Assisted Care serves ZIP codes that encompass all or part of each of the cities listed below.